On Wednesday, July 6, 2011 Barack Obama will hold a live town hall...using Twitter. That's right, our nation's leader will be answering questions about our current economy and jobs during a live webcast. Questions may be submitted via the askobama.twitter.com website or by using the Twitter hashtag #AskObama. 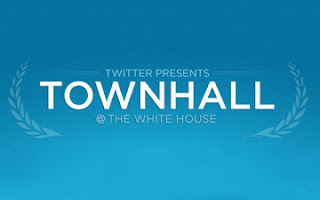 In addition to that, there is also an official Twitter account for the town hall, @townhall, that users will be able to follow in order to receive all the updates. The July 6 live webcast will begin at 2 p.m. ET, 11 a.m. PT. Twitter has designed and hosted the website for the event. The news came via tweet that read, "BREAKING: 1st Twitter @townhall w/ Pres Obama at the WH on 7/6 @ 2ET. #AskObama your Qs on the economy & jobs: askobama.twitter.com." Politicians have recently increased their Twitter usage by using the website to connect with constituents, announce their future plans to run for higher offices and even share important news. One example includes Republican presidential candidates planning on debating via Twitter on July 20 using 140TownHall.com as a platform. What is so interesting about this is that Twitter has yet to actively involve itself in the political process to this extent before. A lot of people like this idea and see Twitter as the perfect digital version of a traditional town hall. The site allows users to voice their opinions and questions to not only the politician but also to the community as a whole. It stands to reason that in the buildup to the 2012 presidential election Twitter will continue to play a more prominent role in the discourse. I don't know how I feel about this. On the one hand, I can see the benefits from doing something like this as a way for Obama to receive questions from citizens all across the country. On the other hand, it feels a little gimmicky to me. What do you think? Do you like politicians' use of Twitter to connect with the public? What questions are you going to Tweet to Obama on July 6? Facebook Topped Out In the U.S.?